I had never experienced such inhumane police brutality till on the 20th of September 2018 and i seek your help. On Thursday 20 September 2018 at 1800hrs I was brutally beaten by the riot police for no reason. I am a Great Zimbabwe University student currently on attachment. I got into town at 1800hrs after I had finished work so that I could go and get transport to go home in Mufakose. 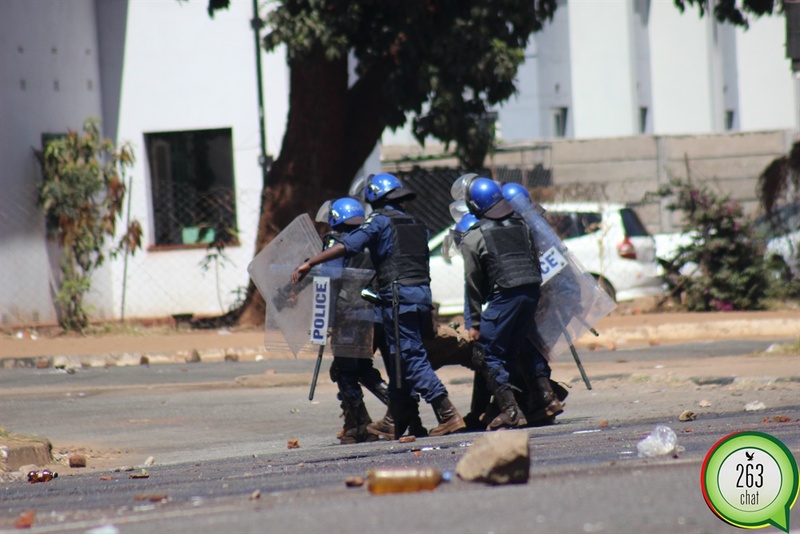 As I was walking down Chinhoyi St at Copa Cabana the riot police, who were targeting vendors, showed up in seven lorries and I was suddenly surrounded by eight riot police officers. One of them requested that I pick up vegetables that were on the ground and I refused and they accused me of being a vendor. I further advised them that I am an ICT student currently on attachment and informed them that I am formally dressed and i am carrying my laptop bag hence I did not see why they were accusing me of being a vendor. One police officer who was quite short suddenly charged towards me, slapped me and my spectacles fell on to the ground as I was about to pick them up, a gang of officers started beating me up with baton sticks, wooden planks, bare hands and fists shouting, “Ibvai pano mavendor” and furthermore ordering me to pick up the vegetables that were scattered all over the street. I was brutalised for 2 minutes whilst I was on the ground. As I got up, there were only 3 police officers left. They gave me a chance to explain, I advised them that I had a partially paralysed hand from a previous car accident. That infuriated them and they further beat me up and I blacked out. As I woke up I thought that they were done with me, only to find my spectacles, laptop and phone were broken. As I was picking up the pieces for my belongings in severe pain, they ordered me to run which I notified them that they have beaten up in such a way that I can’t run anymore. That’s when I felt severe pain in my hand which clearly indicated that my hand had been broken. I went straight to officially complain about the police brutality at the Harare Central Police and they advised me to come back the next day on Friday. There was no reason whatsoever for them to brutally assault me. I am a poor student whose university fees are paid for by the Social Service and now I have a medical bill which I will never be able to pay due to my broken arm. My future is ruined with this broken arm. I would like your assistance to get compensation from the Zimbabwe Republic Police. I have never been caught on the wrong side of the law and my belief is that the Police is supposed to protect us as citizens of Zimbabwe. Therefore, as a poor law abiding citizen, I have the right to be protected in my country of birth and I am hereby kindly requesting for your assistance to sue the Zimbabwe Republic Police.